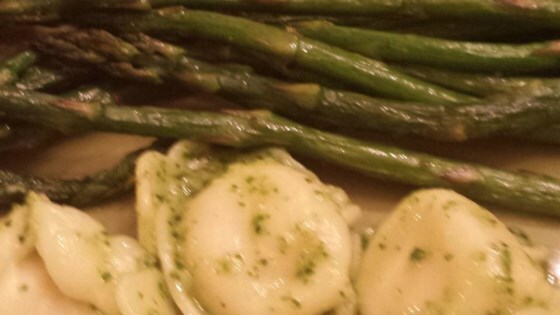 "This is an easy way to make a delicious asparagus side dish, it's simply addicting!" Toss the asparagus with olive oil, Herbes de Provence, salt, and pepper. Spread the asparagus onto the baking sheet in a single layer. See how to create a sensational baked chicken meal in 3 simple steps. This was on the edge of bitter. I had no "herbes de provence" but used a small amount of each of the ones normally found in that blend - it was a different way of fixing asparagus, though. Wonderful use of Herbs de Provence. I added a potato, tomato and a little yellow and red pepper. My husband loved it! fabulous and very easy, great for a large dinner crowd, prep ahead and pop in the oven at the last minute. This was a fantastic recipie but I think I used too much spice. A little bit goes a long way but was a hit at Easter Dinner!